YAVORIV, Ukraine -- U.S. paratroopers have arrived in Ukraine for Operation Fearless Guardian, a six-month effort to train Ukraine’s newly established national guard force. 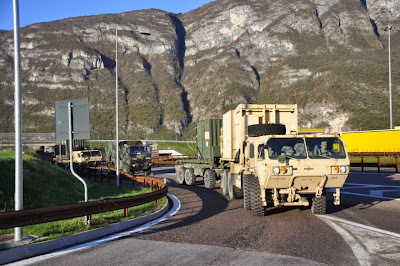 Paratroops from the 173rd Airborne Brigade Support Battalion pull over at a highway rest stop April 7, 2015, near Trento, Italy. The first troops from the 173rd Airborne Brigade arrived Friday in western Ukraine, delivering military cargo after completing a 1,100-mile convoy from their home station in Vicenza, Italy, the Army said. “The equipment on the convoy consists primarily of logistics vehicles to support and enable the training effort in Ukraine,” said Capt. P.J. Hartman, a battalion transportation planner with the 173rd, in an Army news release. The convoy of 50 paratroops and 25 vehicles traveled through Austria, Germany and Poland before arriving in Yavoriv, Ukraine. Formal training with Ukraine’s national guard will begin later this month. About 300 U.S. soldiers will deploy for the effort, which centers on training three battalions of Ukrainian troops in a range of infantry tactics. The initiative isn’t the first time U.S. troops have worked in Ukraine. Since Russia’s annexation of Ukraine’s Crimea peninsula last year and ongoing hostilities with Russian-backed separatists in the country’s east, U.S. soldiers — under the Operation Atlantic Resolve mission —have deployed several times to training grounds in western Ukraine. The latest mission was initially slated to begin in March. It was delayed by U.S. officials, who wanted to allow time for a new cease-fire agreement between Ukraine and the separatists to take hold. Last summer, turmoil in Ukraine forced the Army to postpone its Rapid Trident exercise. The mission, which included troops from the 173rd, was eventually carried out in September. In recent months, U.S. special operations forces also have conducted medical training with Ukrainian forces.